When was Disneyland’s King Arthur Carousel built? Although the King Arthur Carousel was one of the original Disneyland rides at the California park’s opening in 1955, the merry-go-round was originally made in a) 1875 by the Dentzel Carousel Company. Walt Disney purchased the ride for $22,000 from Sunnyside Park, a popular amusement park in Toronto, Canada that operated from 1922 to 1955. Walt Disney insisted all 72 horses be leaping, so some had to be reconfigured from their original design while others were found on other old carousels. I love the idea of a carousel in theory. In actuality, all of that spinning makes me dizzy. I’m more of a Space Mountain type of gal. What’s your favorite Disneyland ride? Tell us in the comments! 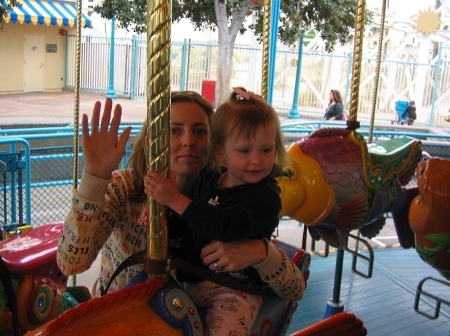 I love the carousel because I can feel the happiness of all the kids on the ride. Oh Mama! You are so sweet. I think your picture is actually the King Triton Carousel in California Adventure. The King Arthur Carousel has horses and is surrounded by the rides of Fantasyland, which would have been in the background of your picture. King Triton’s has fish. Lorri – You are so right. I just changed the caption. Good catch! Home » BLOG » When was Disneyland’s King Arthur Carousel built?